Dear Dumb Diary - Book 9 - That's What Friends Aren't For. 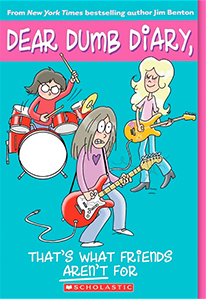 Home > Dear Dumb Diary > Dear Dumb Diary - Book 9 - That's What Friends Aren't For. So now I'm friends with Angeline. This is Automatic Friendship, and I have to just accept it and make the best of things. See, if I objected, then Aunt Carol might divorce Angeline's uncle, sending both of them tumbling into a deep pit of depression for the rest of their lives, and Angeline could wind up feeling so guilty that she would have to go be locked up in an old dirty insane asylum for years and years, and Stinker's puppies could grow up not knowing both their parents --- and I couldn't live with myself for doing something like that to a puppy.